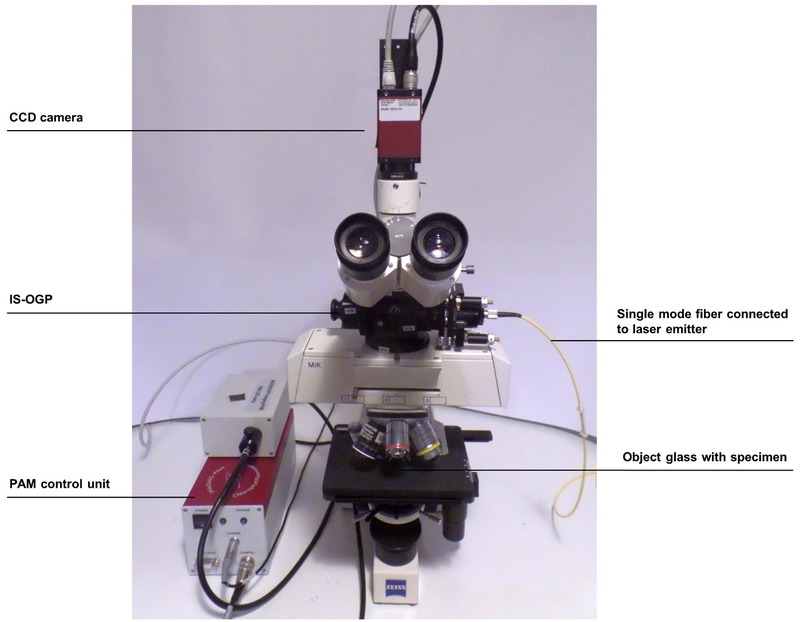 This IS-OGP unit shown below was attached between the filter cube slider and the eyepiece trinocular of an epi-fluorescence microscope (model Axiostar plus FL, Carl Zeiss, Jena, Germany). White laser light was first passed through the spectral filtration unit of a SuperK COMPACT supercontinuum laser (NKT-photonics, Denmark), wherefrom a single mode fiber channeled the spectrally selected wavelength to the IS-OGP. Chlorophyll fluorescence of the sampled specimen was induced with pulse amplitude modulated measuring light of 450 nm using a chlorophyll fluorescence imaging system (RGB microscopy imaging PAM, Heinz Walz GmbH). The position and beam spot of the laser were recorded with a CCD camera mounted on the microscope and processed in the software ImagingWin (Heinz Walz GmbH). Samples were observed at 200x magnification.